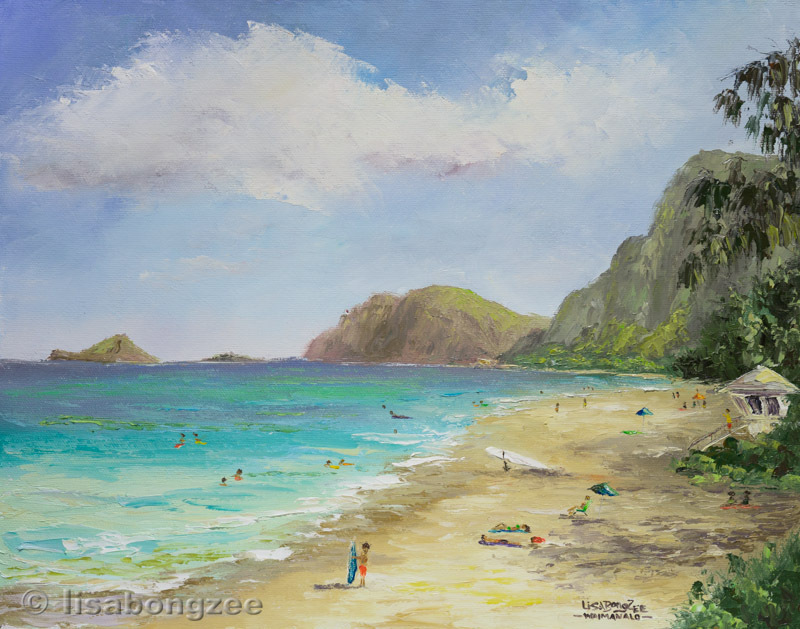 “I Love Kailua Town Party”. 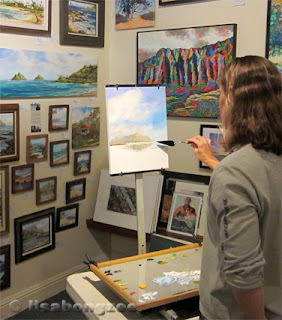 Island Treasures Art Gallery has so many amazing creations from hundreds of local artists, and I am lucky to have my own wall of paintings here. It is a great place to spend an afternoon, come down and check it out! 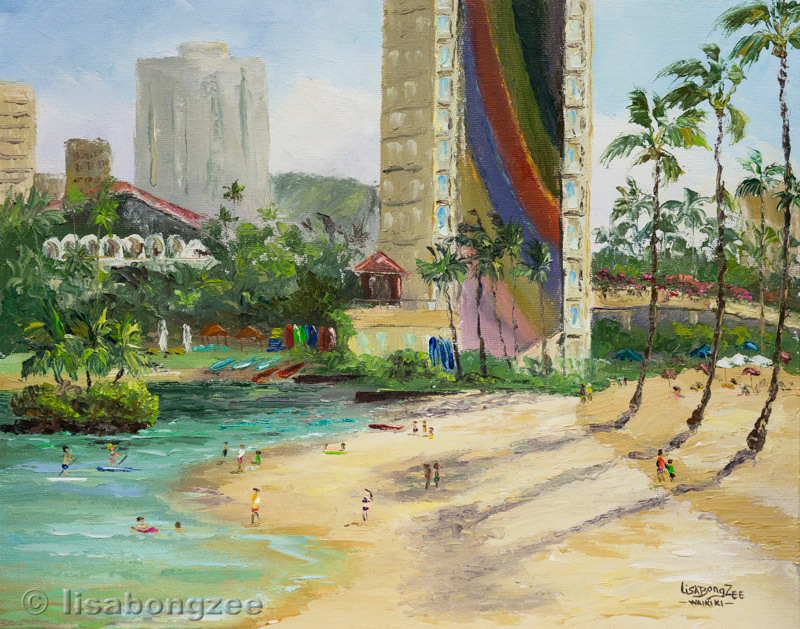 Hilton Hawaiian Village’s Rainbow Tower and lagoon. Here stay some mo' small kine paintings, l'dat. A fun afternoon spent "working" near the lifeguard shack at Waimanalo Beach, also known as Sherwoods. 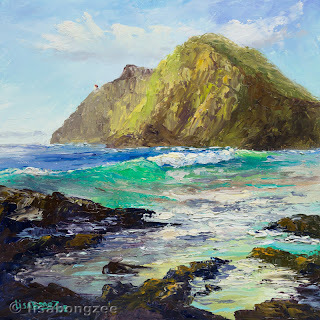 Still enjoying painting my 6x6 mini gessos. 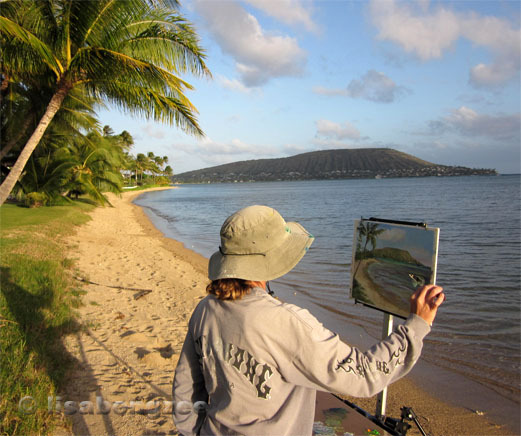 Spent a very peaceful afternoon last month painting Paikos. Isn't this a gorgeous place? Paikos Palette Knife Plein Air 11" x 14"
After painting so many mini’s on gessobord panels, I decided to give a bigger size gessobord a try. 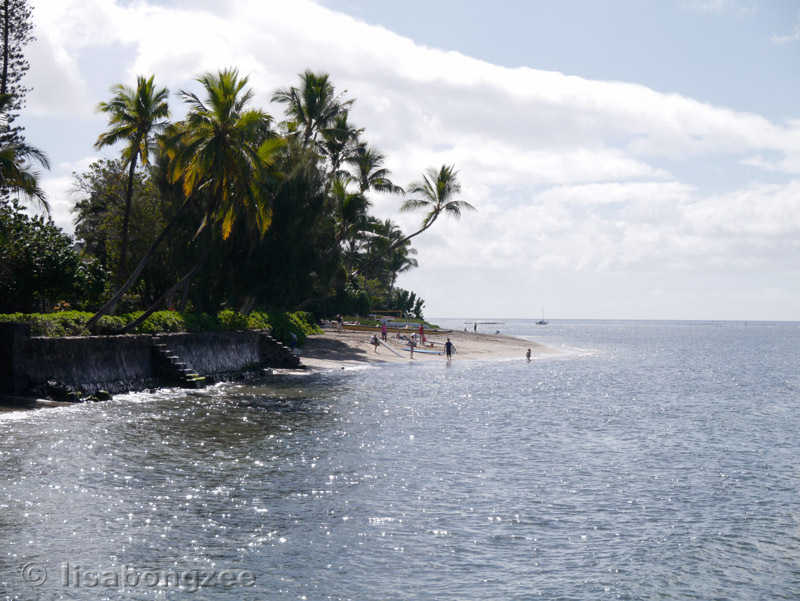 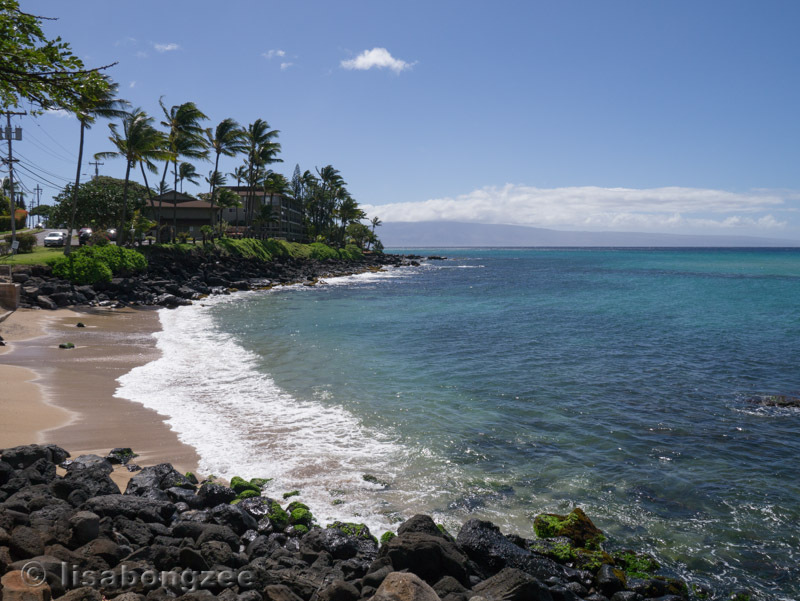 Although Waimea Bay on Oahu’s North Shore is known for it’s giant winter surf, in the summer months, you can find the bay looking more like a lake. 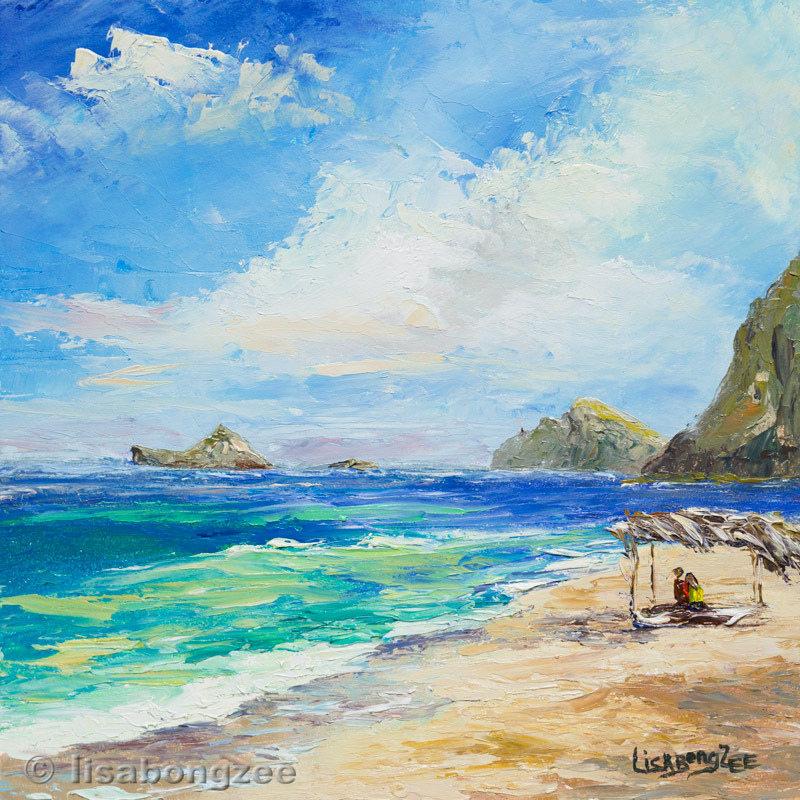 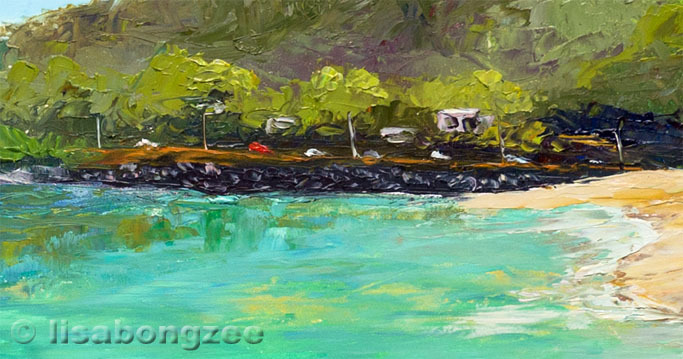 "Summer Day At The Bay"
is a 12” x 24” palette knife painting. 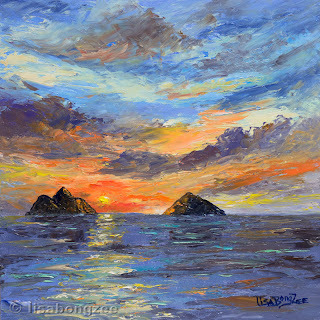 Painting on smooth gessobord is much different for me, using a palette knife, than stretched canvas. 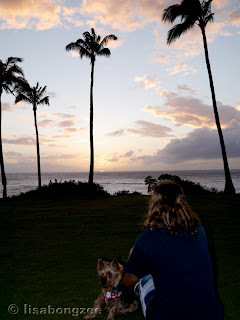 I like some of the effects it gives you. 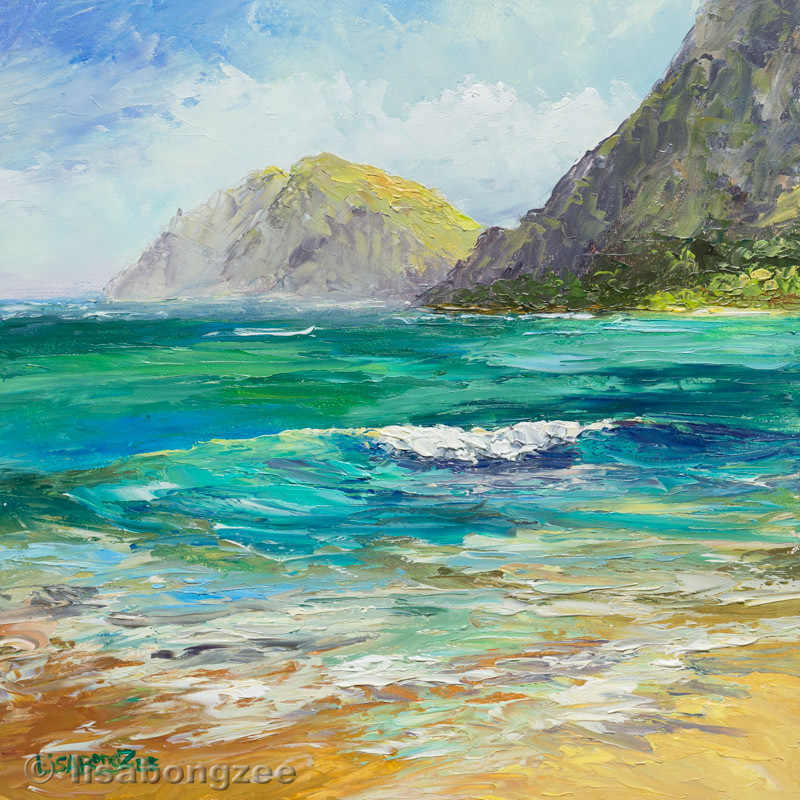 It's easier to get detail without the texture of the canvas, and the colors seem to pop, but it sure is slippery! 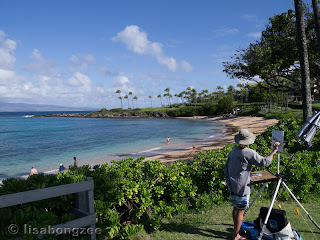 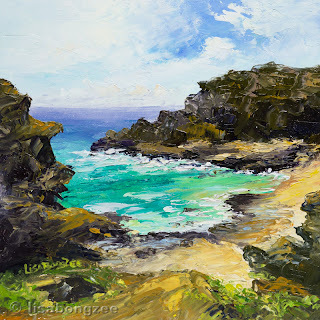 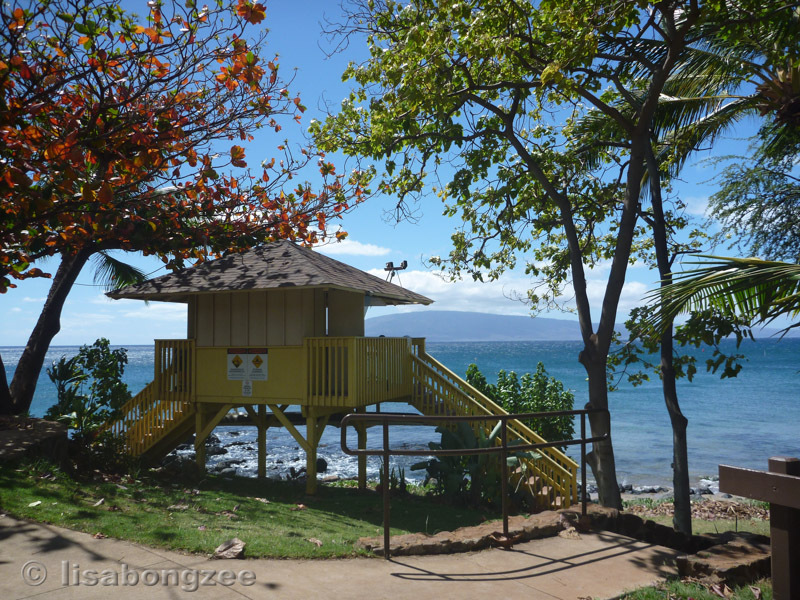 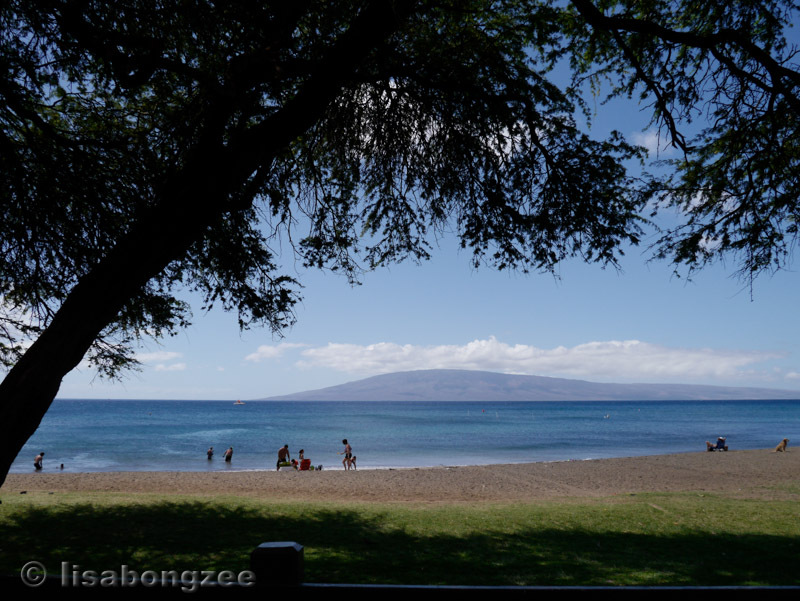 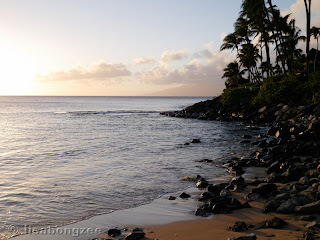 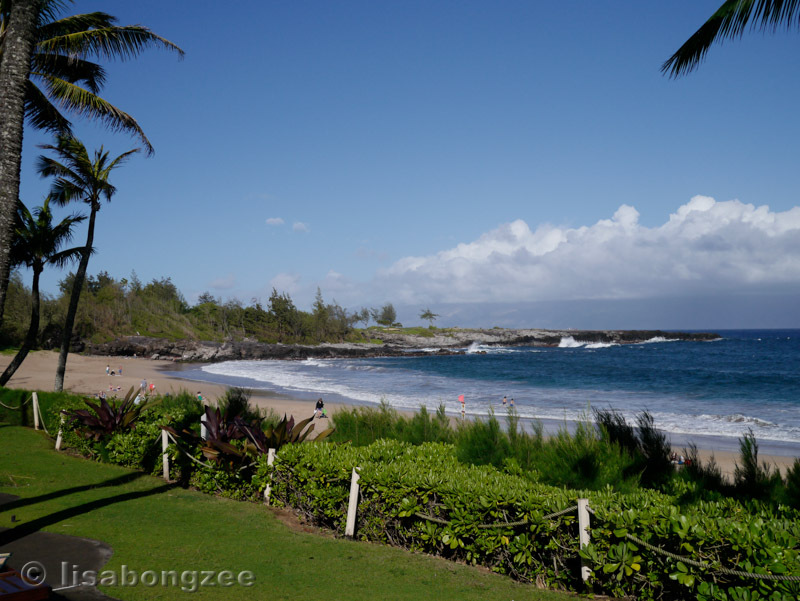 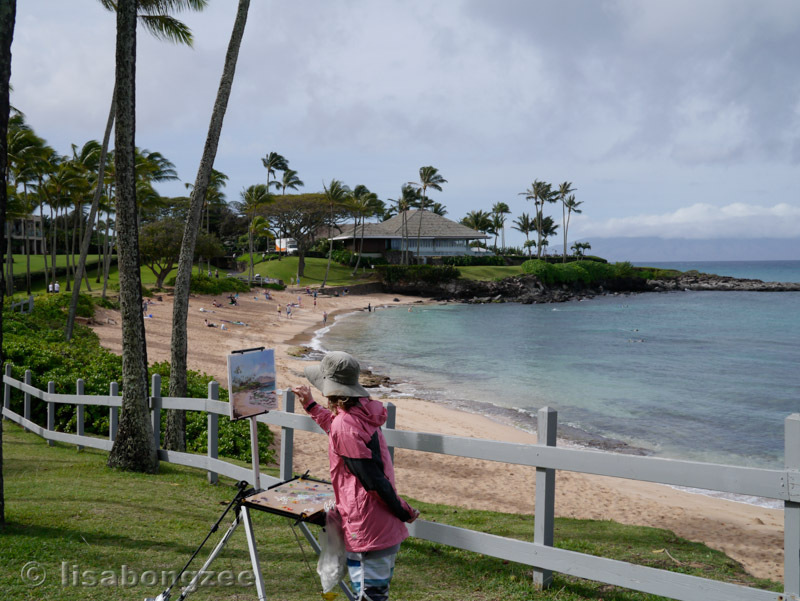 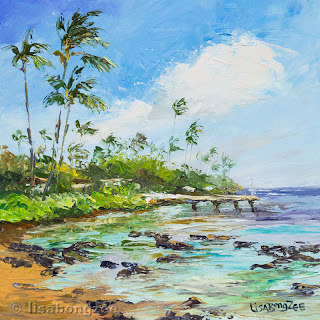 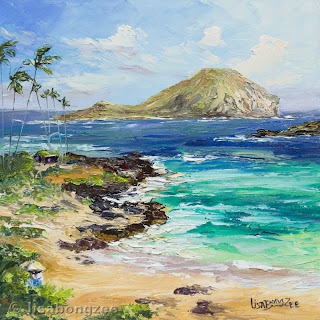 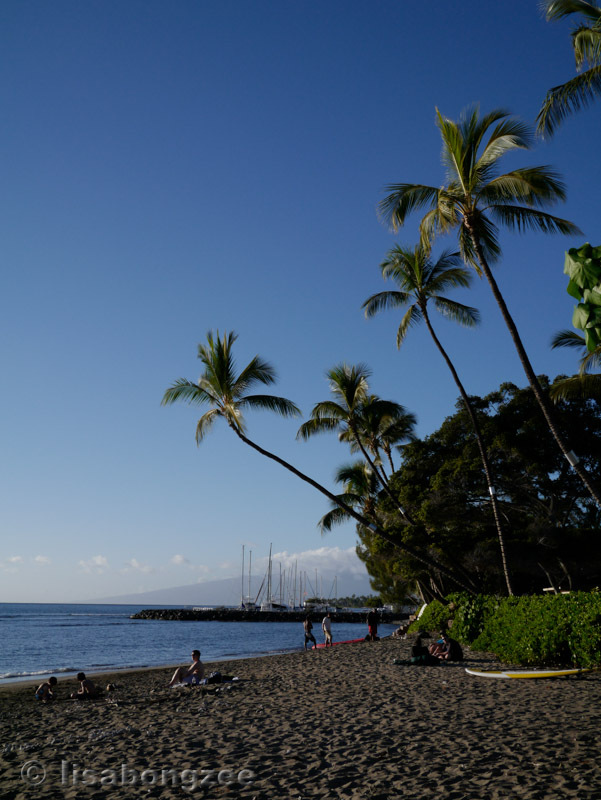 The second week of our Paintcation was spent up in Kapalua on the north shore of Maui. Here are the plein air paintings I did while there. 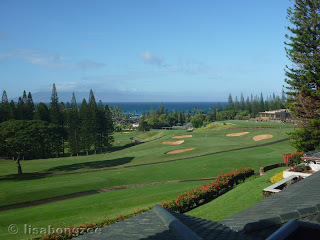 We stayed in a nice little condo overlooking the golf course and Kapalua Bay. It had a pretty large lanai, so our first day, I just decided to paint the scenery from there. 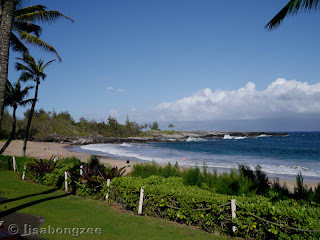 The next morning, the weather wasn't too promising, but we headed down to Kapalua Beach. As I set up my easel, the high winds kicked in and started blowing my painting stuff all over the place. Then the heavy rain started. 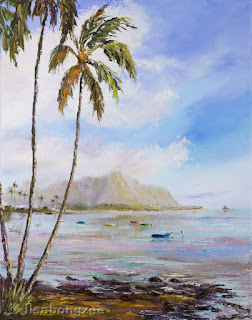 I seriously thought of just packing back up before I even got started, but I decided to hang in there. 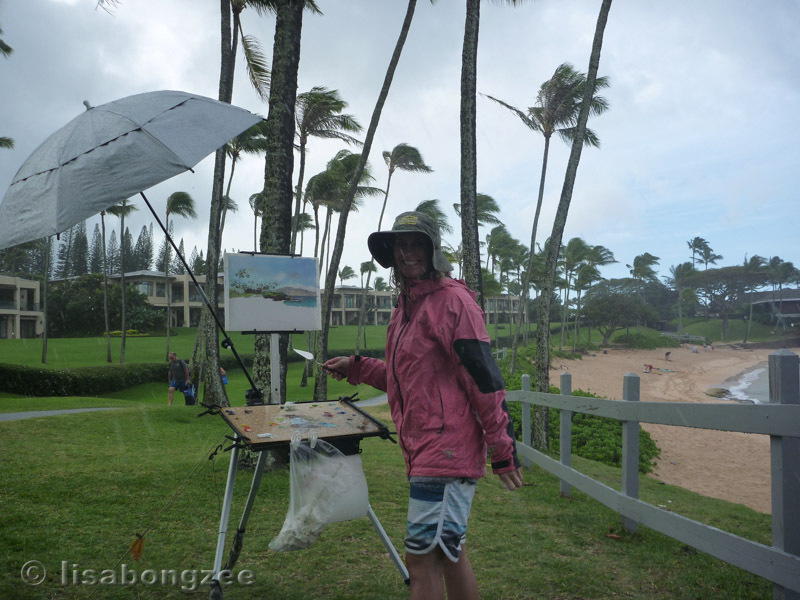 The winds and rain would come and go, and about half way through my painting, a HUGE squall came through. 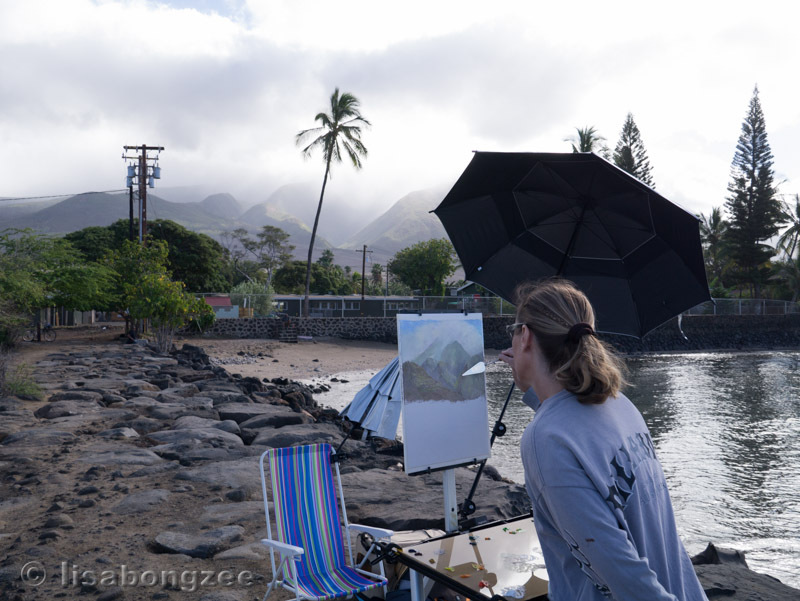 It was CRAZY but luckily Dean had staked my easel down well and it wasn't budging. 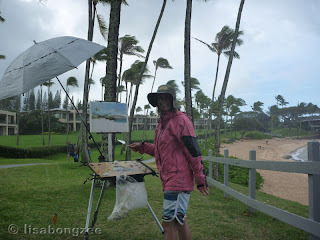 I had my rain jacket on so I was dry and warm. The winds were too much for my umbrella and I ended up having to take it down, but it didn't really matter. 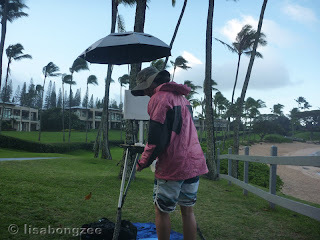 I had seen Mark Brown paint in a rainstorm before with no problem and I thought to myself, "If Mark can do it, I can do it". 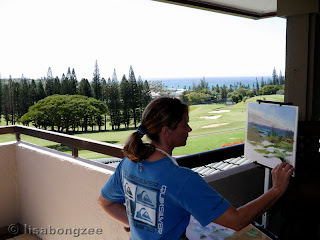 It was actually kind of fun! 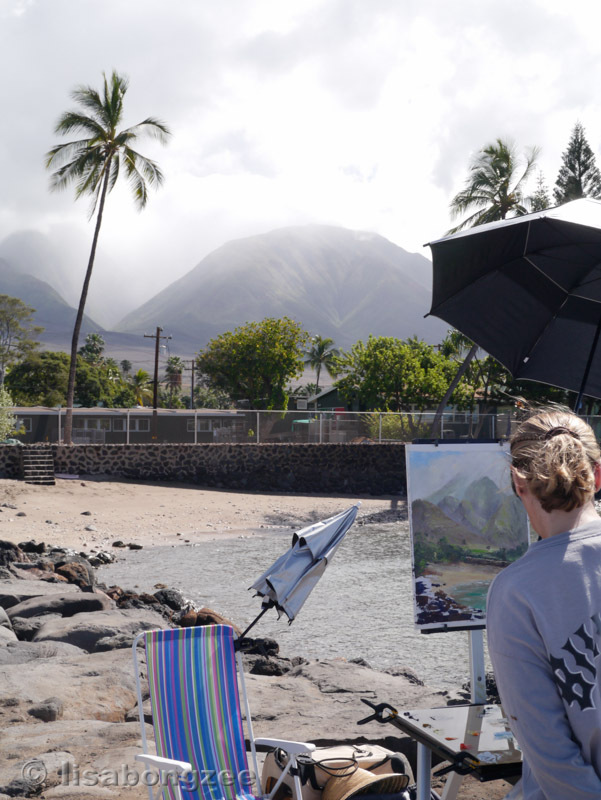 My palette was a complete puddle, but luckily, oil paints don't mix with water, and the rain didn't have much effect at all. 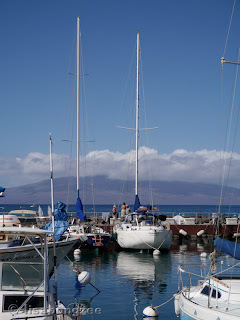 I had to worry more about the high winds, and the fact that the scenery wasn't quite as nice as earlier. 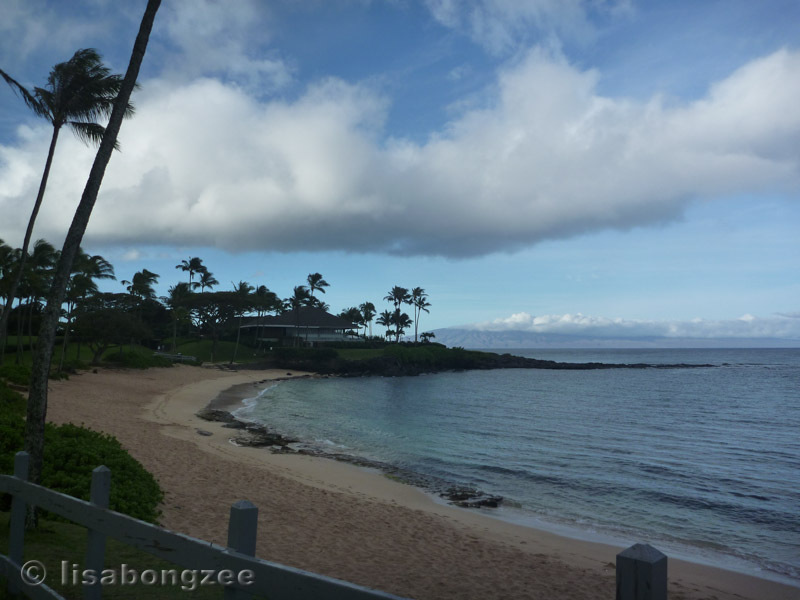 Once again, the clouds passed, the wind died down and the sun popped out for just a short time. 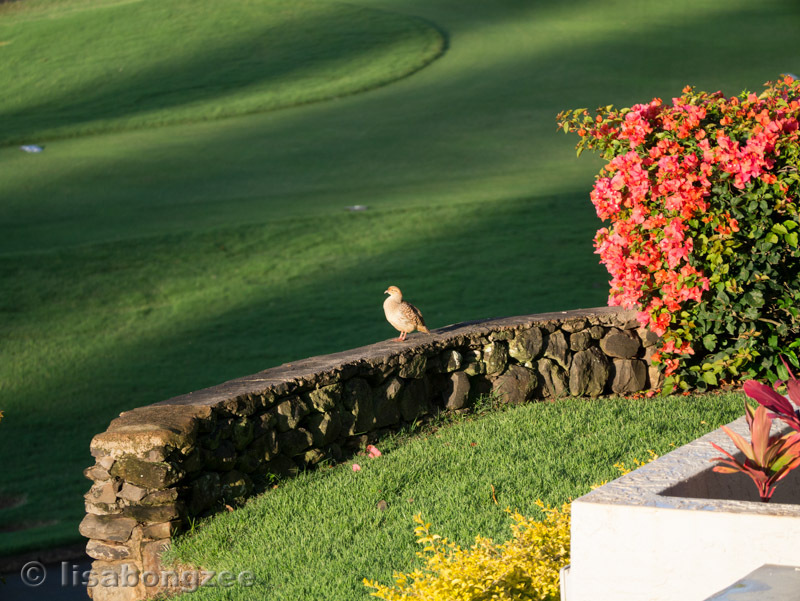 Almost every morning, our natural alarm clock was that of the Grey Francolin. They are a funny looking grouse-like bird that likes to hang out in the low grasses. 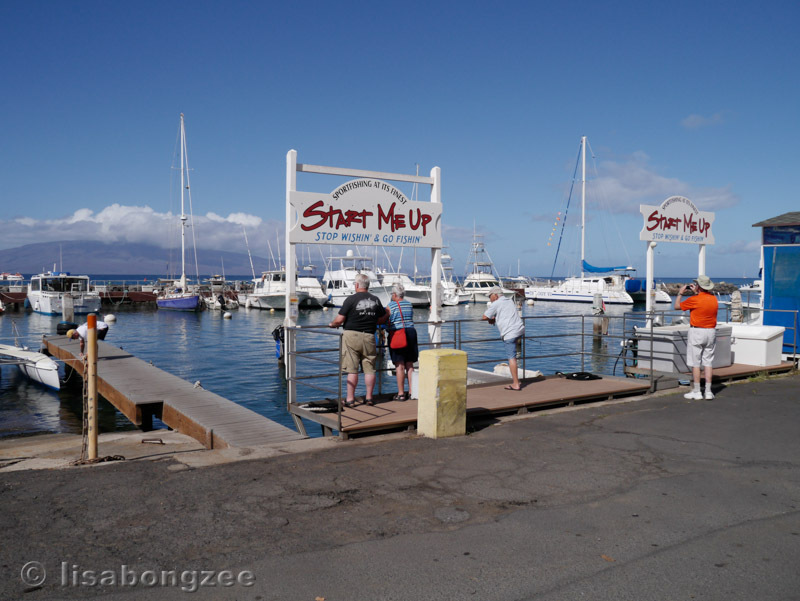 They have a very distinct and LOUD call. 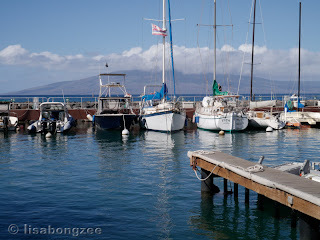 The weather was nicer today but still windy. There were heavy rains and even flash flood warnings for most of Maui Island throughout the week, so I was happy to see a bit of blue sky. 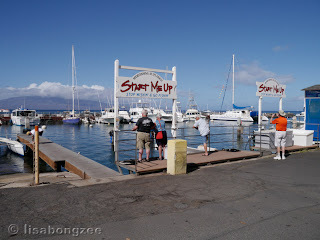 We headed up to D.T. Fleming Beach. 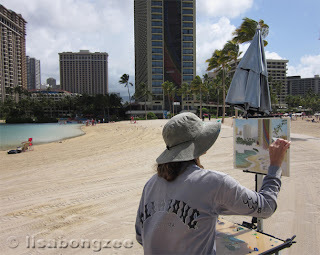 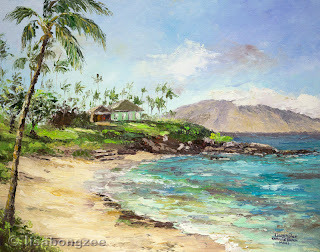 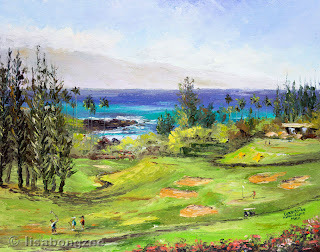 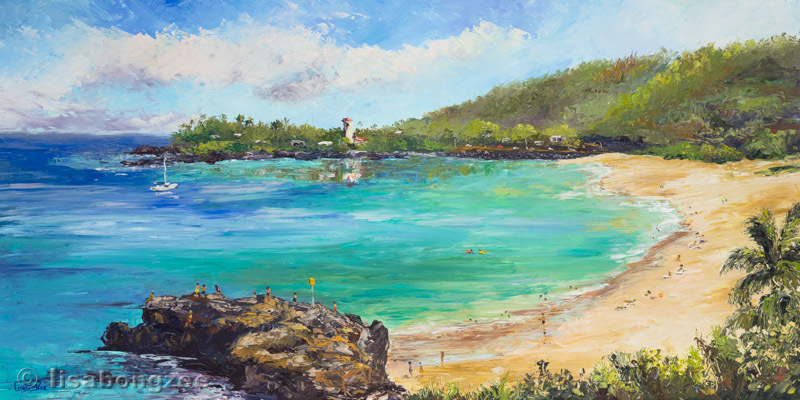 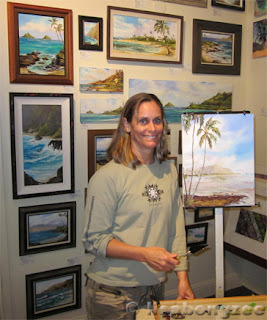 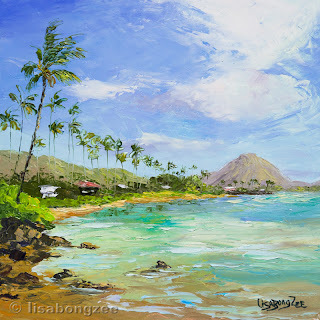 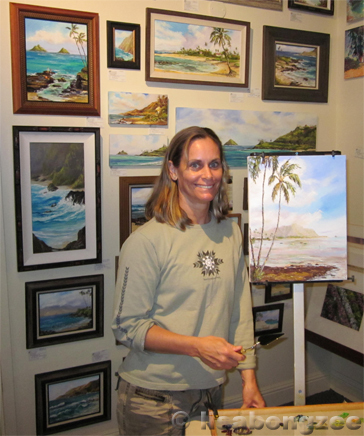 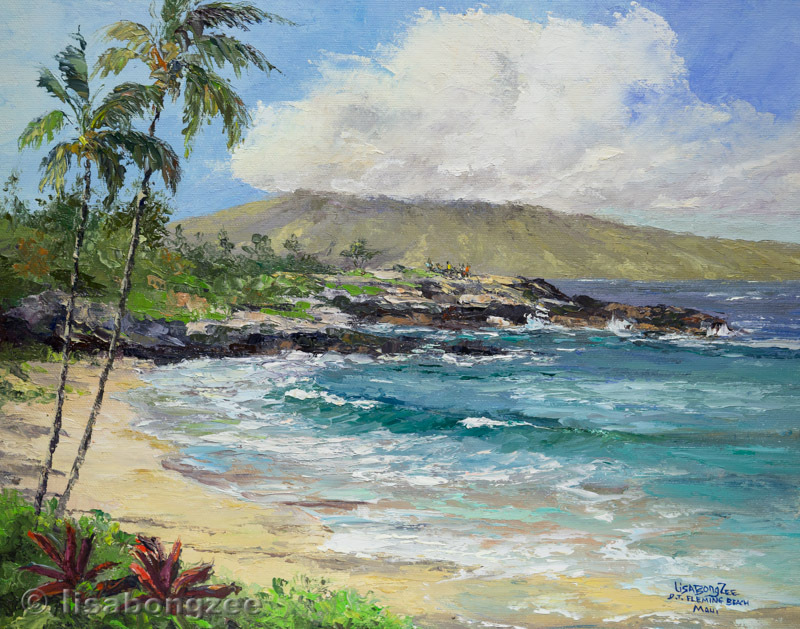 I got permission to paint from the grounds of the Ritz-Carlton Kapalua. They were very nice to me, and it ended up being a great place to paint - very protected from the wind. 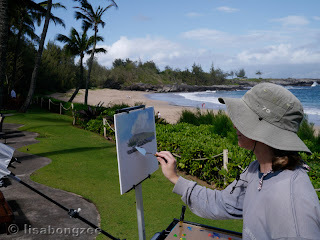 This painting practically painted itself and I was very happy with the end result. 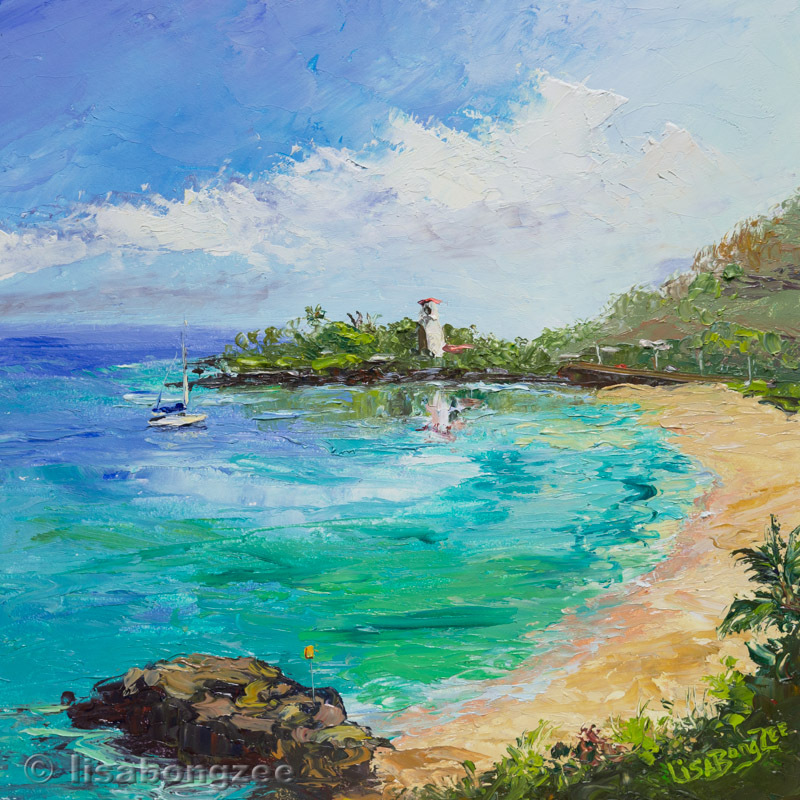 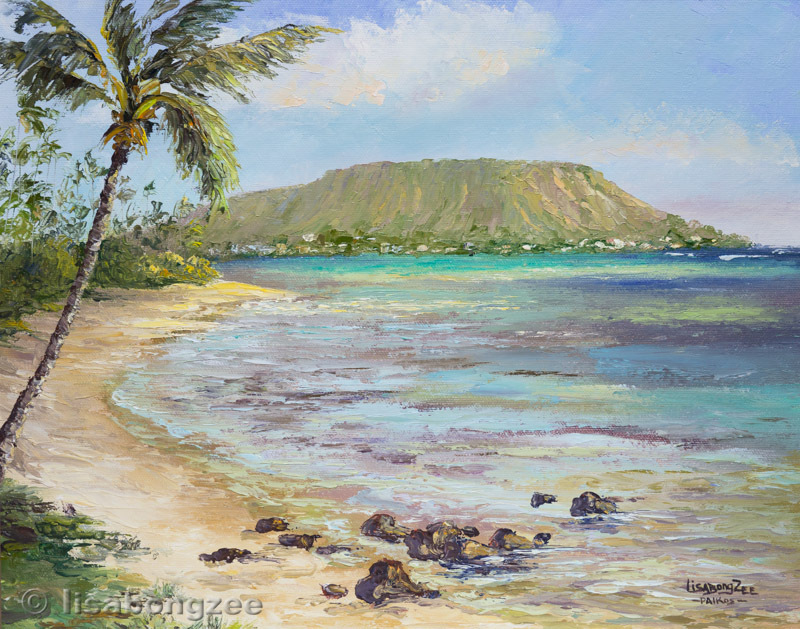 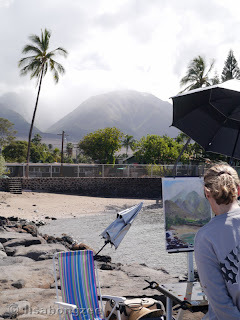 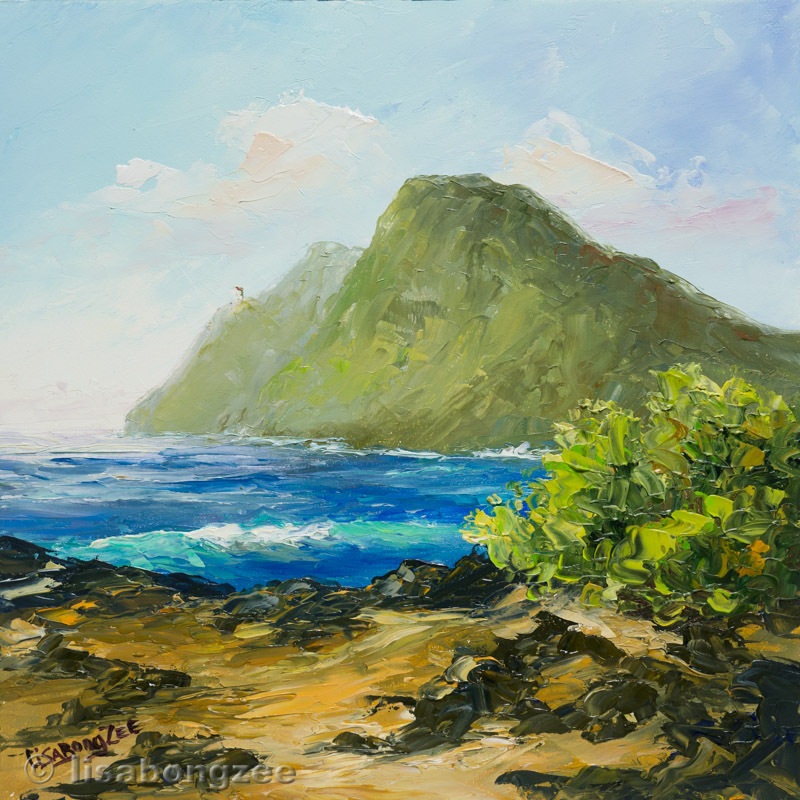 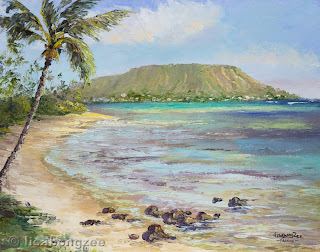 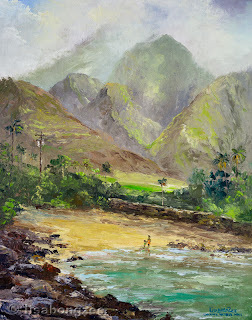 The day that we went to watch the final "Quick Draw" of the "Maui Plein Air Invitational", Betty Hay Freeland painted a beautiful scene of the West Maui Mountains from the breakwall at Lahaina Harbor. A few days later, I decided to give it a try. 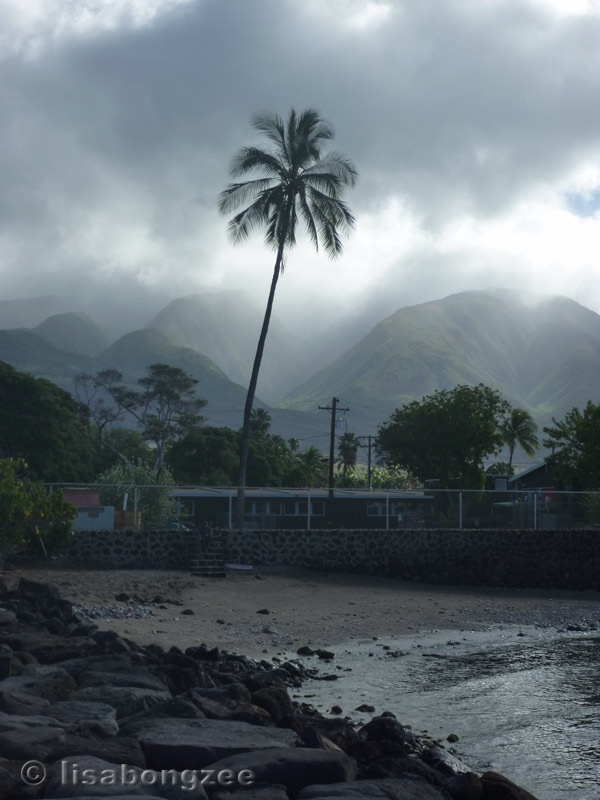 The clouds would roll in and completely cover the mountains, so once in a while, I had to take a break and wait them out. There were many other sites to enjoy though. 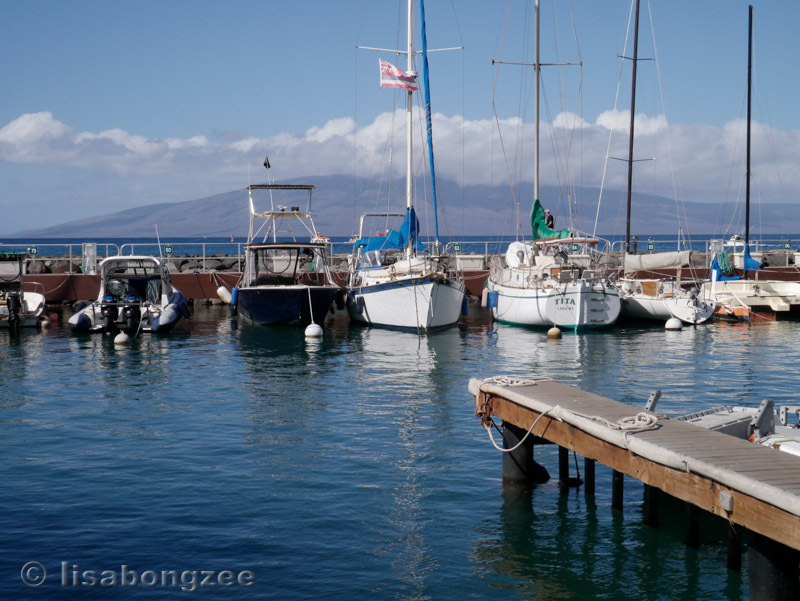 The clouds stayed over the mountains for today, everywhere else around me was nice and sunny. 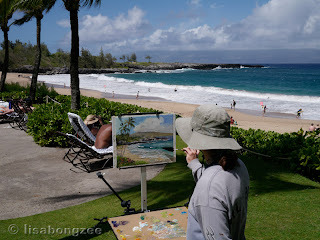 This painting also seemed to flow from the palette knife and was one of my favorites of the trip. 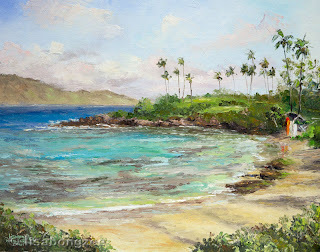 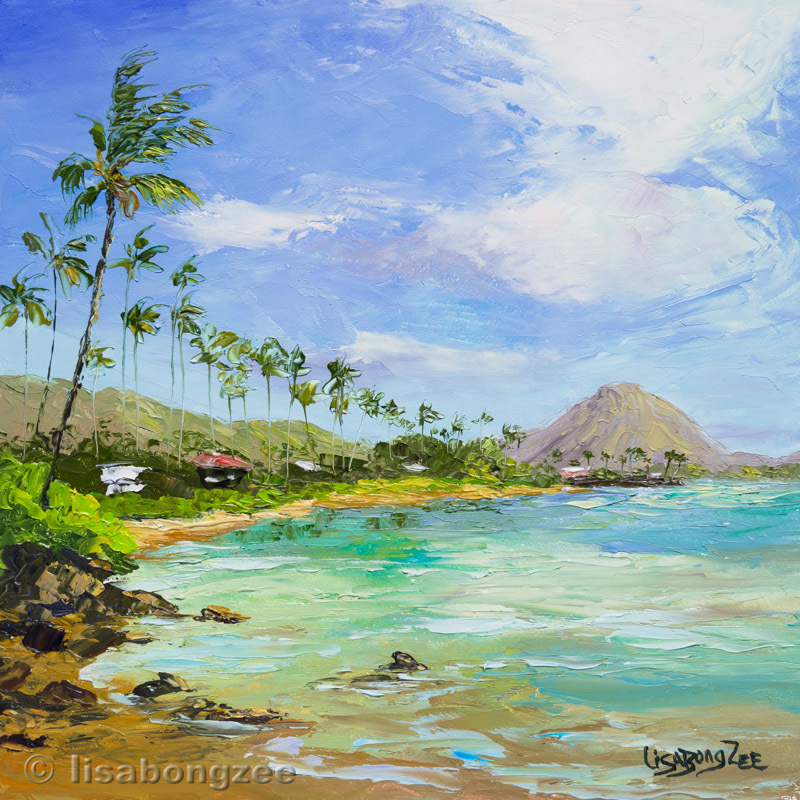 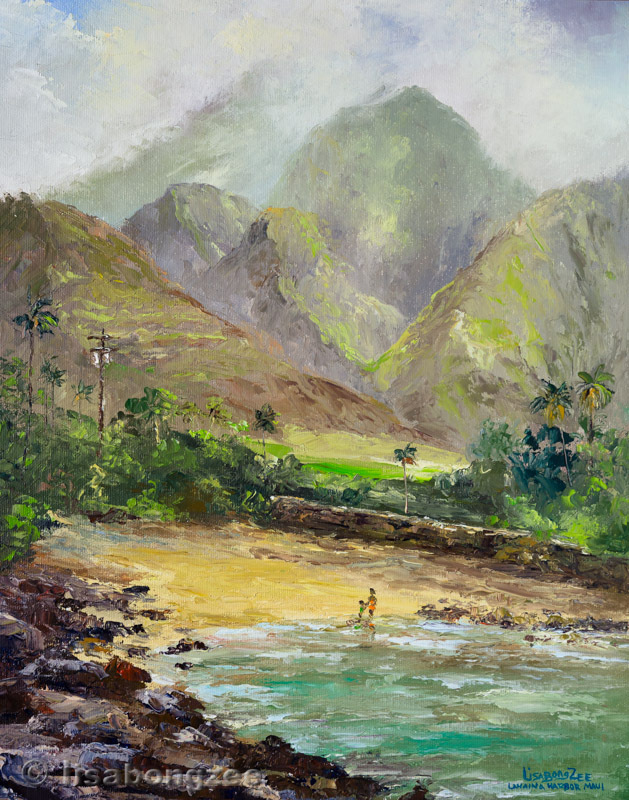 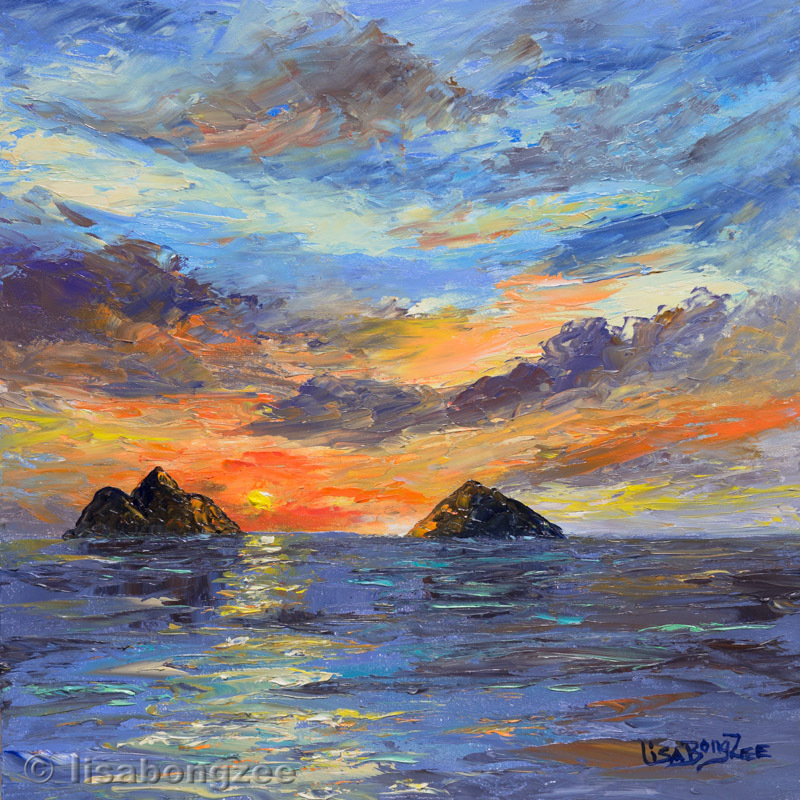 When I returned home, a lady that lives on Maui bought this painting, and it went back to where it was created. We spent the rest of the afternoon sight-seeing. 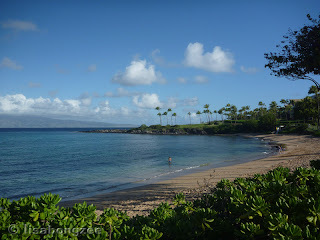 Our last day found us back at Kapalua Beach. 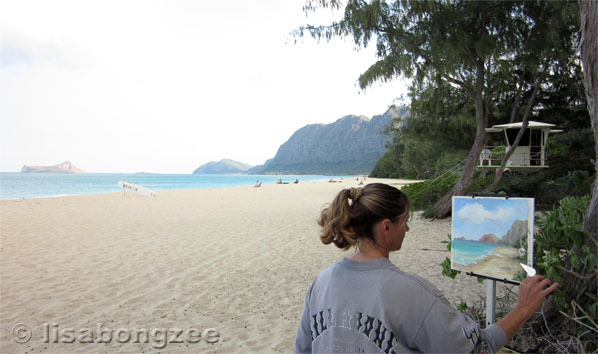 This time, I painted looking north. Enjoying our last sunset on Maui.